A judge has ruled that New York City's buses must display a controversial ad that refers to Muslims killing Jews. New York's Metropolitan Transportation Authority (MTA) had opposed the advertisement, arguing it could incite terrorism and violence. But Judge John Koeltl rejected the argument and said the ad was protected under the US constitution, which enshrines the principle of free speech. The ad is paid for the American Freedom Defense Initiative. It has already been displayed on public transport in Chicago and San Francisco. The advert shows a threatening-looking man with his head and face wrapped in a scarf, next to a quotation attributed to a music video from the militant Palestinian group Hamas. The quote says: "Killing Jews is worship that draws us close to Allah." The advert asks: "That's his Jihad. What's yours?" 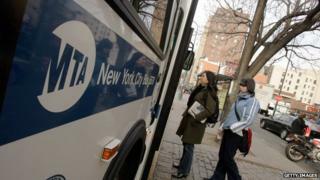 Judge Koeltl said that although he was sensitive to security concerns, the MTA had underestimated the tolerance of New Yorkers and overestimated the potential impact of the ad. "It strains credulity to believe that New Yorkers would be incited to violence by ads that did not incite residents of Chicago and San Francisco," he said. He delayed enforcing his ruling for 30 days so the MTA could decide whether to appeal. MTA spokesman Adam Lisberg said they were "disappointed in the ruling and are reviewing our options".